Powered by an offense that scored a league-leading 26.8 points per game, the 1990 Buffalo Bills won the AFC title. 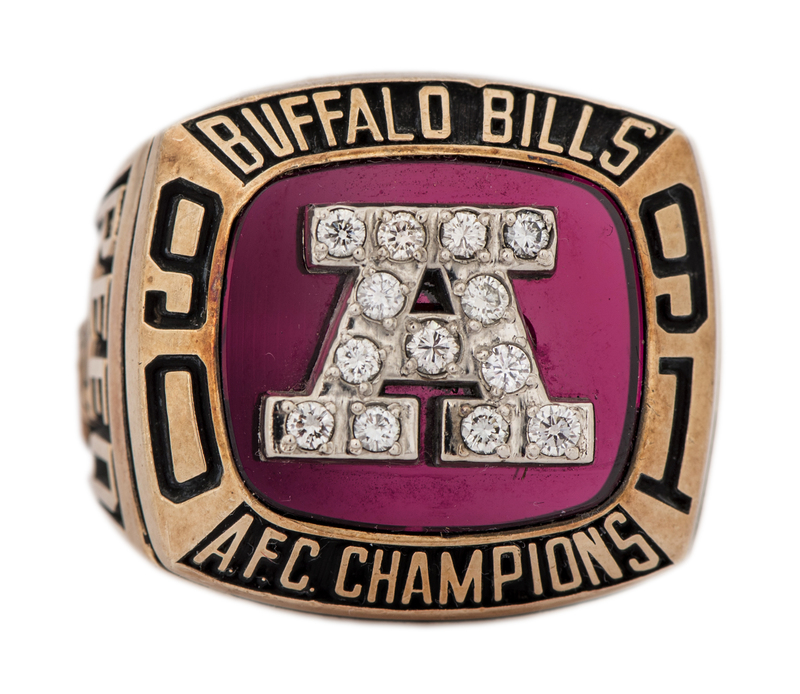 In 1991, the Bills actually took it up a notch, putting up 28.6 points per game, in finishing the regular season with a mark of 13-3 (identical to the year before). Once again, the team was led by the trio of QB Jim Kelly, RB Thurman Thomas and WR Andre Reed, and each had big seasons. Kelly threw for 3,844 yards and 33 touchdowns; Thomas rushed for 1,407 yards and seven TDs (to go along with 62 receptions); Reed caught 81 balls good for 1,113 yards and 10 TDs. 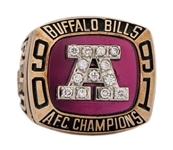 After playoff wins over the Kansas City Chiefs and Denver Broncos, the Bills – just as in the year before – won the AFC title, and just like that previous season they also fell short in the Super Bowl, this time to the Washington Redskins. 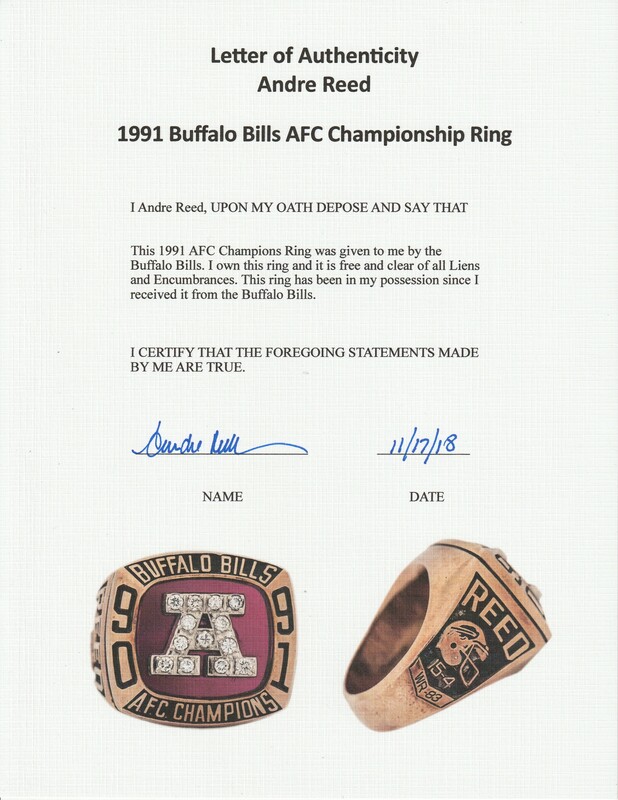 Presented here is a Jostens 10K gold 1991 Buffalo Bills AFC championship ring that was given to Reed. It features 13 round diamonds that make up the letter “A” which is set on a large red colored stone. “BUFFALO BILLS 90 91 A.F.C. CHAMPIONS” reads in relief around the bezel setting. 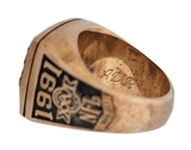 One side of the shank displays the Super Bowl XXVI logo, with “1991” above it and “NFL” below the logo. At the bottom are Reed’s position and uniform number (“WR-83”). 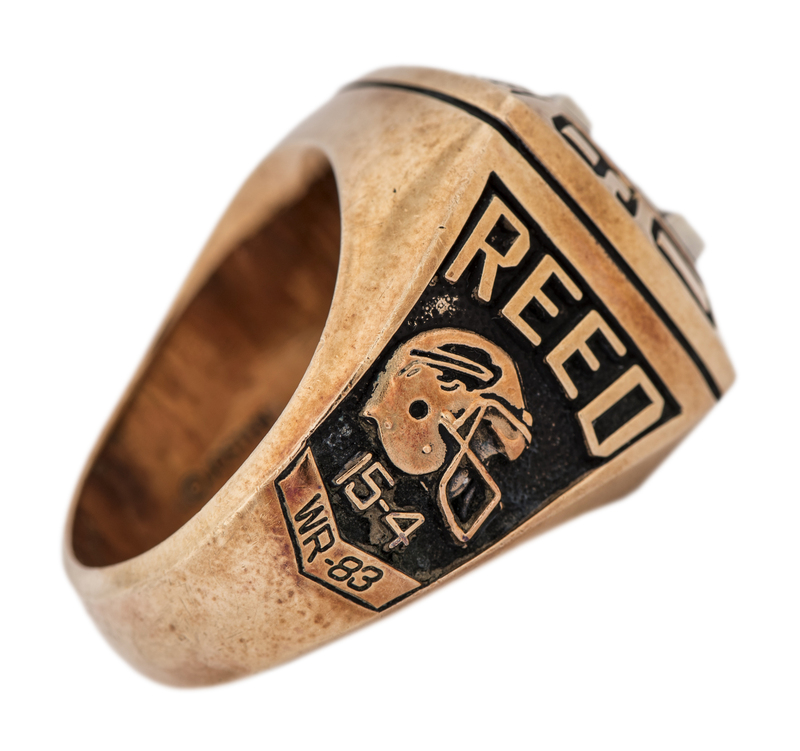 A Bills team helmet appears in the center on the opposite side, along with the name “REED”, the team’s overall record (“15-4”) and “WR-83”. 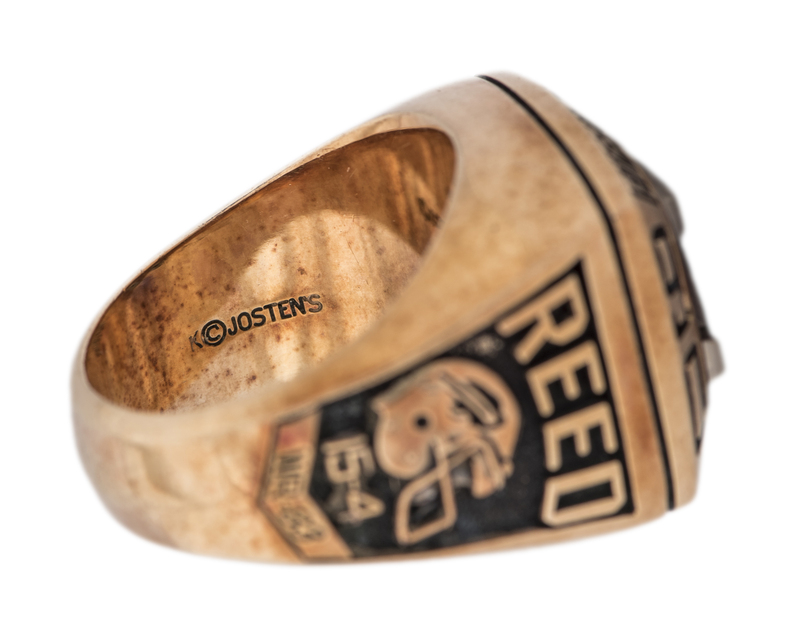 The inside of the band shows wear and includes the manufacturer’s mark and Reed’s initials of “ADR”. 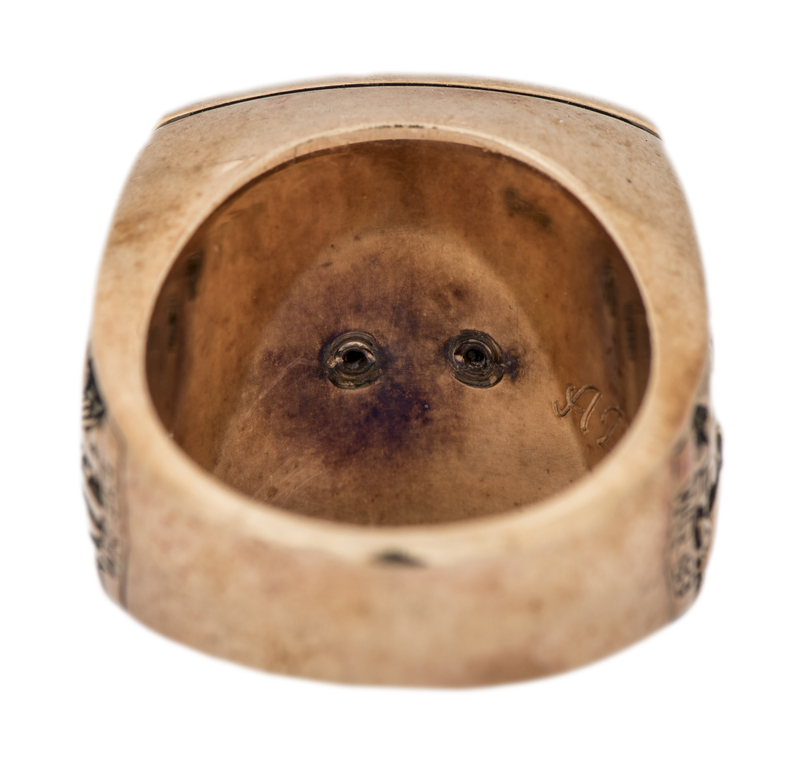 This item weighs approximately 40.1 grams and is an approximate size 11. 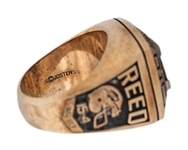 This ring comes with a LOA from Andre Reed.